Its hard to improve on the not so humble spindle, but it may well have been done, and none of the alternatives are too costly. If you want to make your own, I do have some freebies further down the page. I start with the commercial offerings, since they are very original and probably easier to purchase than make. There is a magic take on the supported spindle called a Spindolyn. It sits in its own cup and you spin off the tip. The only drawback I can see is that if you have problems flicking your spindle, this may not be any easier to use, but it certainly doesn't stop me coveting one! There is also a spinner called a kick spindle or wheel. It is larger than a standard spindle and sits in its own base and stand, like the spindolyn, but is angled. It has a large whorl below its shaft support and you kick this with your foot, while your hands concentrate on the business end at the tip. It is also known as the Mother Marion's Kick Spindle. However, for a different take on spinning, there is also the spinner. Known by various different names, these spinners are used by the Maya of Guatemala to spin vegetable fibres into rope. Boy Scouts in the USA have made something very similar for one of their badges. It provides the modern spinner with a versatile tool that takes up very little room, and gives excellent control over the yarn as it is formed, nor does it require you to click or flick your fingers. Making a simple Mayan spinner is not beyond even the most inexperienced wood-worker. You will need an 8 inch length of 2 inch wide by 1/2 inch thick wood with a very fine grain - hard wood is best. An 8 inch length of doweling. A large bead to fit over the end of the dowel. Optional - A paper template, a ruler, and pencil. A hand or jig saw, an electric drill with drill bit a size larger than the dowel, and sand paper. A wood rasp or file would be very handy but not essential. Glue to hold the bead in place. You can mark these measurements directly onto your piece of wood if you don't want to make a template. 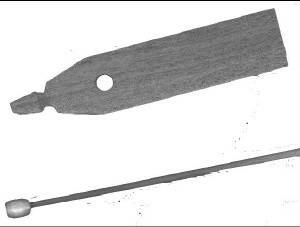 The length of the spinner is approximately 7 to 8 inches long. About a third of the way down from one end is a hole just larger than the piece of dowel you have. This allows the spinner to rotate around the dowel. Taper the end of the spinner, as you see in the picture, and make a groove in the wood halfway between the hole and the end of the wood. You will be using a half hitch here to attach your just spun yarn to, like you attach your yarn to the hook on a drop spindle. If you want to get fancy, you can make a "waist" to the storage end of the spinner, although if its flat its convenient for sliding your yarn straight off. I have tried altering the shape somewhat, but this is really one time when "If she ain't broke, don't fix it!" The Maya knew what they were doing! Make sure that everything is very well sanded down so that your fibres don't catch. Glue the bead over the end of the piece of dowel. This is what stops the spinner shooting off the end. To use the spinner, you basically whirl the paddle around the dowel exactly like a kids whirligig toy. 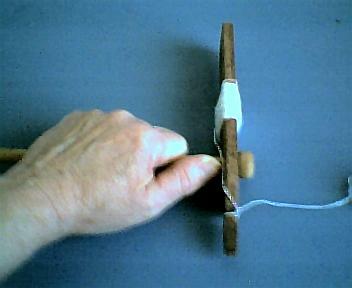 The yarn that is attached to the thin end gets twisted, exactly the same as with a drop spindle, and you can use similar park and draft techniques until you are confident to try different techniques. It is possible to do a long draw with this gadget, and it is much faster than a spindle. If you have arthritis and have difficulty grasping thinner objects, you can either use a much thicker dowel, or, if you use 8mm dowel, you can put a rubber pencil grip on it to make holding it more comfortable. If you prefer to have a ready made spinner, Finniwig make an almost identical spinner. They also have inkle looms, weaving sticks, lucets, and other wooden spinning and weaving tools. I have no affiliation, I just love the eye-candy! For the simplest of all spinning tools, and how to use them, (a rock or a piece of wood make excellent kicker spindles!) check out the new online magazine Spindle and Wheel for more details and instructions. They also have great tutorials on spinning and fibre prep as well as patterns etc! Anderson Marilyn, Guatemalan Textiles Today: figs 32 & 33 pp46-47. Watson-Guptill Publications 1978 N.Y. These photos are copyright. Part of the Pioneering Merit Badge from http://www.usscouts.org involving ropemaking. Instructions are included for making a spinner.